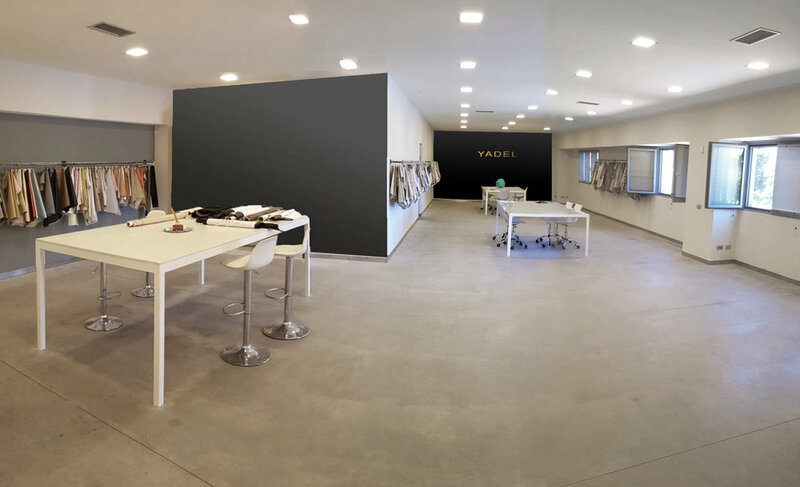 YADEL is a modern company with an innovative business model: externalizing production to exclusive Italian tanneries and specializing in the creation of leathers with unique designs. Slender but with a vast catalogue of products, the company maintains constant and elevated quality that allows it to target clients in the luxury market. 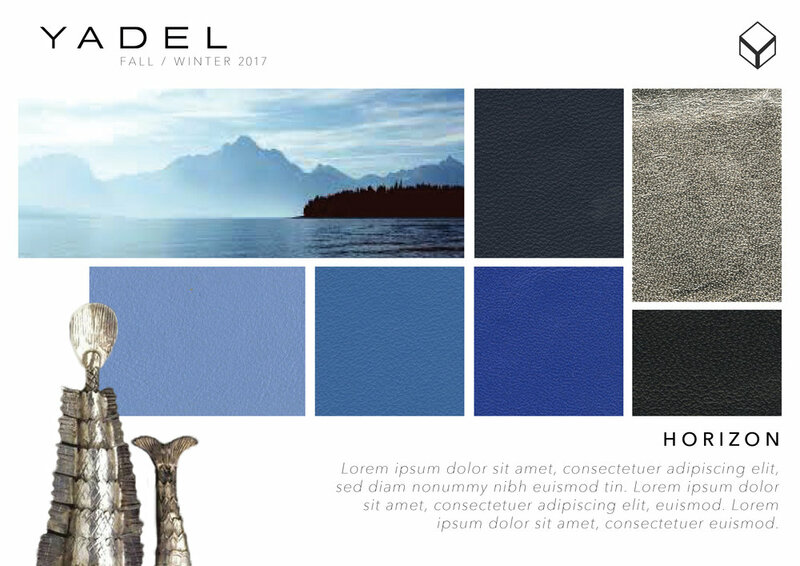 Not only does YADEL develop new designs every season with internal trend hunting talents, it can create tailor-made innovative leathers for its clients. 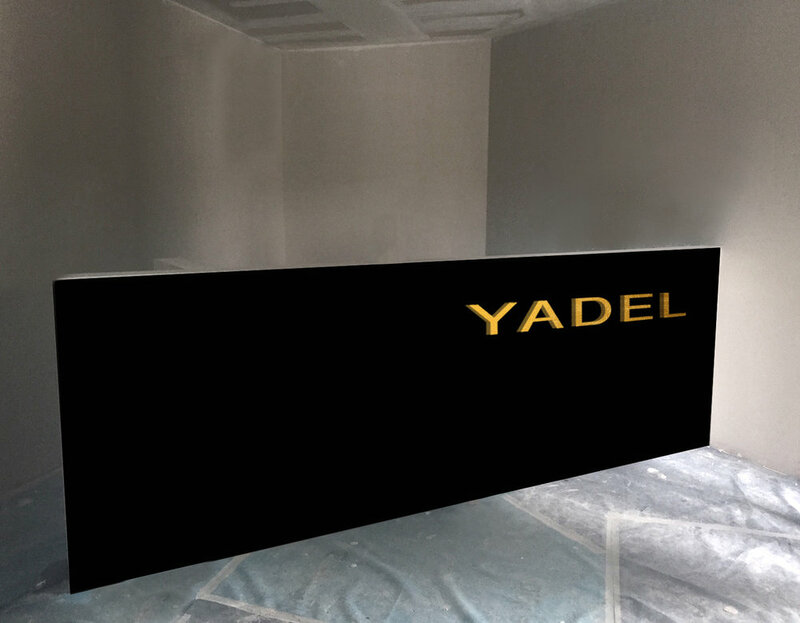 In 2017 YADEL decided to refresh their branding and aimed to grow the luxury clientele, whom can better appreciate and give value to the company’s product innovation and top quality. The logo was given a slender look to achieve a more elegant look, still minimal but refined with black and gold instances. Furthermore, two graphic elements were develop to give a “voice” to two corresponding product lines. Some examples of printed collateral that has been updated with the new gold on black color scheme (and their more basic black on white variation): business cards, envelopes and letterhead, packaging details, and catalogue cards. Graphic elements were developed as secondary logotypes, to identify separate product lines. The square is an archetype that represents the physicality of Earth and a solid foundation. With the Y as a protagonist, it conveys the unity and strength of YADEL’s model in the creation of high quality leathers that stand the test of time. The triangle, or pyramid, is an archetype that represents ambition towards something more spiritual with its tip reaching for the sky. 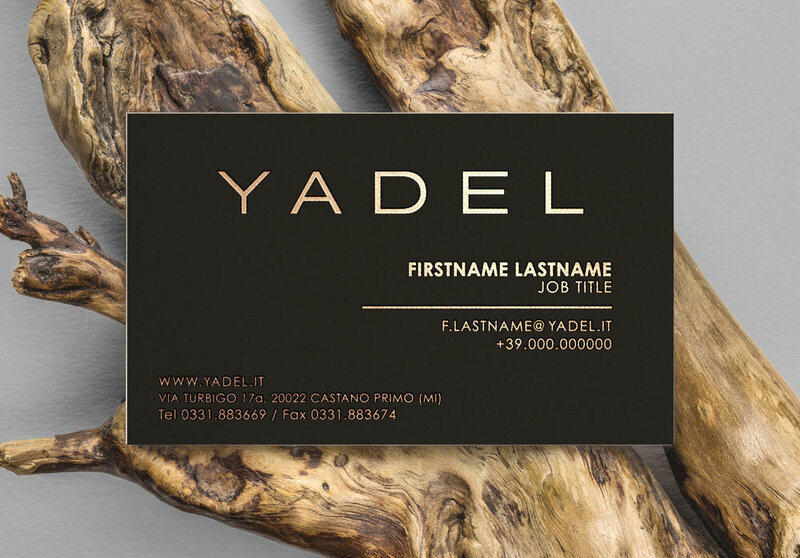 In this case it conveys YADEL’s research and production of innovative leathers. The brand’s initial is again the focus element. 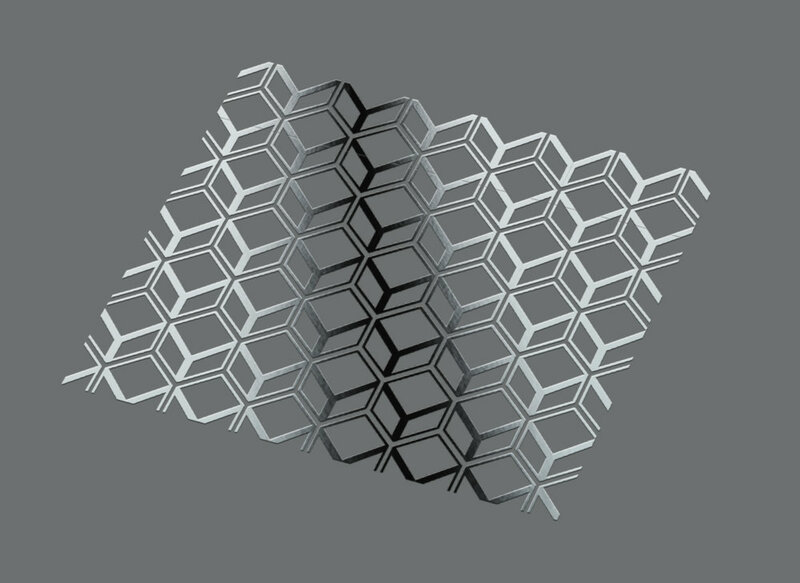 Studies of patterns that lead to the final designs. Below, example of use for the custom patterns: here as special packaging paper for leathers in the top of range categories. To enhance the luxurious qualities of the product, the posters were printed with white gloss over white paper, to create a shiny textural pattern. The patterns are also stamped in gold foil on the back of the leather sheets of this more luxurious product range, together with order codes. Starting from a luxurious paper box with printed gold foil and all the way to the actual gift of the pyramid design, this product sampler is a real experience that increases brand awareness in the client’s mind. The goal is to entice the display of these objects in the decision makers’ office, even just as a paper weight on their desk like in the picture on the right. 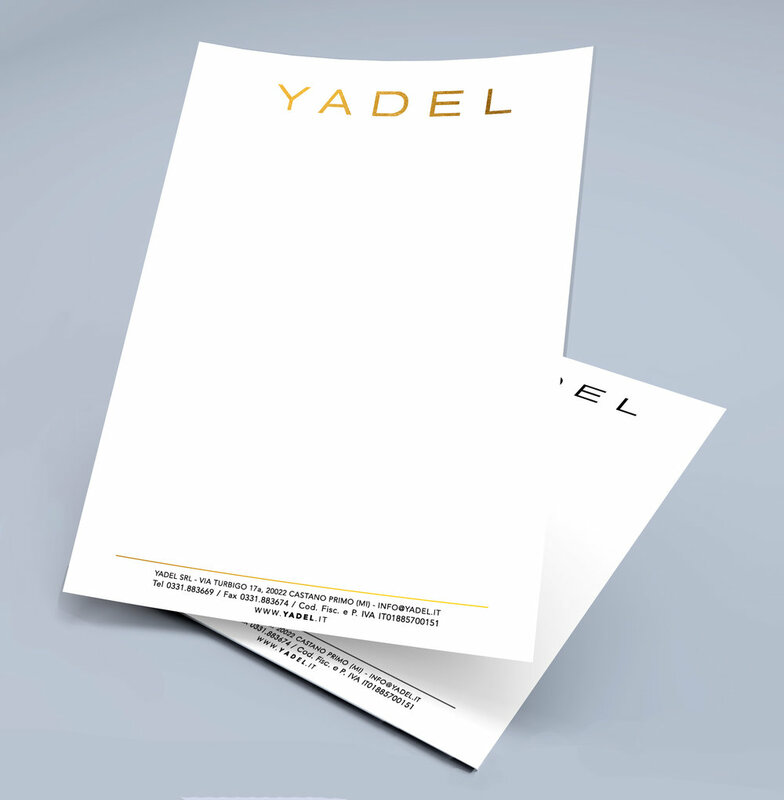 Every season YADEL needs to show its existing and potential clients a catalogue of products. Not every one can see them in person in their showroom, so they invest in physical samples, shipped directly to the interested buyers and designers. A leather pyramid with five key leather from the newest collection. It doubles as a designer object for the client’s office decor, with the aim to remain constantly in view and in mind. 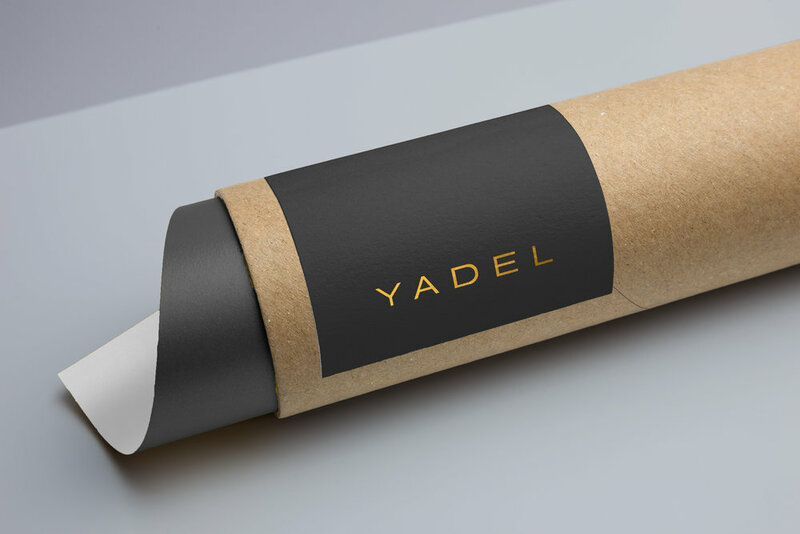 This solution was proposed to overcome YADEL’s difficulty to show innovative and unexpected products, while also increasing brand awareness during the designers/buyers decision making process. A digital catalogue was designed to integrate the few physical samples produced every season. This interactive online publication contains the full product database and is very easy to share. It is divided in: collections - that act as mood boards and allow the company to push unexpected products as well as new listings mixed with bestsellers; and a classic product list for the wider database - organized by color, leather type and product line. When hovering on a sample, its product code appears on top. Below the code is a “+” sign - clicking on it brings the user to the product’s page. Trade fair LineaPelle 2017 overlapped with an important religious holiday that family-owned YADEL wished to respect. For this reason, the company decided to showcase an “exhibit” that replaced products in their booth and would allow them to keep it open while unsupervised during the last two days of the fair. Paper shapes were displayed instead of the leathers, with quotes and keywords that represent the brand’s vision. 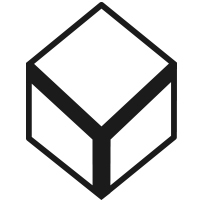 Placeholders that created a parallel between YADEL’s promises and its products. Above, a mock-up of the temporary showcase vs. the usual product display on the left side. On the right, a photograph from the trade fair. The brand identity’s study also covered the showroom’s renovation. Amongst various proposals that were presented to create a cohesive brand story throughout the space, below you can see some related to signage. The new brand colors were used for the walls and detailing (black and grey) and the logo was reproduced in gold channel letters. Proposal for the office’s entrance: reception desk with gold sign. Final result with sign installed on the wall for additional visibility. Proposal with sign in the niche on the left, for special top-of-range product lines’ display. Proposal with sign in the back wall and grey niche on the left.